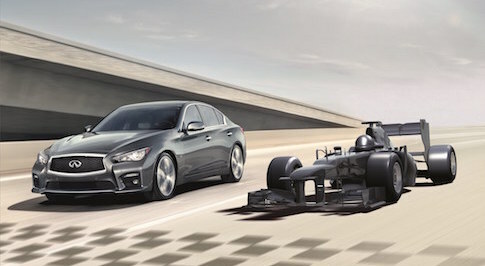 Red Bull Racing sponsor and luxury car manufacturer Infiniti have launched their Ultimate Test Drive competition, in which a lucky driver will win an incredible VIP F1 experience. To be in with the chance of winning, customers need to visit any UK Infiniti centre and complete a test drive before August 16. A random selection of 25 finalists will then go head to head at Rockingham Motor Speedway, where their driving ability and car control will be assessed by a panel of judges  including Infiniti Red Bull Racing Test & Reserve driver Sebastien Buemi. Drivers in Russia and the Middle East will go through a similar selection process and then one finalist from each country will join together to partake in driver training on the Infiniti Red Bull Racing simulator at the team's factory in Milton Keynes. The trio will then be flown to Dubai to test drive a real, fully race specification Formula One car with personal guidance from Infiniti Red Bull Racing driver Daniil Kvyat. Following the once in a lifetime driving experience, they will then get to relax and watch the action at the Abu Dhabi Grand Prix as part of a VIP hospitality weekend for two, courtesy of Infiniti. Carl Bayliss, Country Manager at Infiniti UK commented: "Never before has Infiniti offered a prize of this calibre and we are delighted to be able to reward potential and existing customers with an opportunity like this. Our partnership with Infiniti Red Bull Racing has helped us to emphasise the performance part of our DNA, so offering one winner the chance to experience the ultimate test drive is a real testament to our own Inspired Performance."